For some cultures death is the beginning of a spiritual purification process that starts with decomposition and ends with skeletonization. The people in these cultures believe that before a soul can reunite with their ancestors in the Land of the Dead the body must completely decay. There are typically two burial phases in these societies: initial and secondary burial. During the initial burial the body maybe buried or exposed while it decomposes, and the funeral ceremony during this phase marks the beginning of the soul’s journey. Once the remains are completely skeletonized the bones are collected, cleaned, and placed in a secondary burial, like an ossuary. After the secondary burial, the deceased is considered truly dead and the soul is resurrected to join their ancestors. Below is a discussion of burials customs of Jews of the early Roman Empire; burial customs of Southern Italy that were practiced until the early 20th century; and the Malagasy famadihana, or turning of the bones, which is practiced today. The Jews of the early Roman Empire practiced a burial custom called ossilegium between 30 B.C.E. and 70 C.E. Ossilegium, a Latin word that means the collection of the bones, was a two-part process. During the initial burial, the corpse was placed in a niche or on a bench in a tomb. Secondary burial occurred one year later, after the soft tissue had decayed. Family members collected the bones and placed them in an ossuary, a container that holds human bones, which was then placed in a niche in the family tomb. A single ossuary could be used for the bones of more than one individual. Jews of this era believed the deceased’s soul was purified during decomposition, which was essential for resurrection. Putridarium at the Cimitero delle Clarisse in Ischia, Italy. Image credit: Wikipedia. Some Italian Catholics had a funerary custom similar to ossilegium. There are Catholic churches in Italy, like Santa Maria del Purgatorio in Naples, that had architectural structures built into underground crypts for initial and secondary burial. According to these Neapolitan funeral customs the soul traveled to Purgatory immediately after death and stayed there during decomposition. It was believed that while the soul was in Purgatory the living could atone for the sins of the deceased to ensure safe travel to Heaven. They also believed that if they took good care of the decomposing remains the dead would look favorably on the living and reciprocate those good deeds – sort of a post-mortem quid pro quo. Structures called terresante and sitting colatoio were used in some Italian churches from Milan to Sicily to facilitate decomposition up until the early 20th century. Terresante were underground crypts that contained rows of loose dirt where bodies were placed during decomposition, with only a few inches of loose dirt to cover them. On All Soul’s Day, people would visit the dead to put fresh clothes on the decaying bodies. The bodies were exhumed shortly before complete skeletonization and placed in niches along the walls, where they continued the decaying process. After the body had fully decomposed, the skulls were either placed on a long ledge above the niches or all of the skeletal remains were put in an ossuary. Sitting colatoio, or putridarium, were masonry structures built into underground chambers of Catholic churches. Sitting colatoi were a row of masonry seats within niches along walls, each colatoio had holes in the middle of wooden seats that were connected to drainage canals. Immediately after death corpses were dressed in cassocks and placed in a seated position on the colatoio. During decomposition fluids would pass through the hole and the remaining bones were collected and placed on altars or in ossuaries. Famadihana reburial turning of the bones in Madagascar. Photo via Wikipedia. The famadihana (fa-ma-dee-an), or “turning of the bones,” is a funerary celebration practiced every seven years by the Malagasy people of the highlands of Madagascar. Famadihana is a centuries old custom that may have been adapted from pre-modern funeral customs of Southeast Asia. The “turning of the bones” is related to the Malagasy belief that the soul of a deceased family member can only enter the Land of the Dead when the corpse completely skeletonizes. Until this happens, the Malagasy lovingly take care of the bodies of their ancestors until the body completely decomposes. 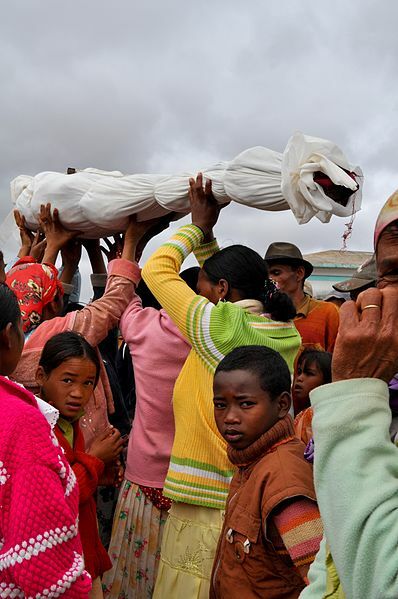 During this ritual the Malagasy remove the decomposing bodies of family members from their crypts then swathe them in fresh shrouds and spray them with perfume. They play music and dance around the tomb with the bodies. When the dancing ends the bundled corpses are placed on the ground, where family members touch the bodies. This is a tradition meant to strengthen family bonds between the living and the dead. Elizabeth Harper at The Order of the Good Death has more information and a more colorful discussion on the putridarium. Katy Meyers at Bones Don’t Lie and Dr. Kristina Killgrove at Powered by Osteons both have great, in depth discussions about secondary burial practices.